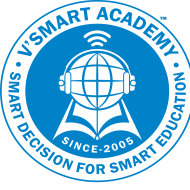 VSmart Academy is founded by IDT Guru CA Vishal Bhattad Sir in 2005 since then we are working on our vision of â? ?Innovative and Quality Educationâ?? in CA, CS, and CMA studies. We understand our students, We know their study challenges, We believe in their dreams & We know how to live them up. We got some best faculties in Vsmart who are dedicated and passionate about their teaching profession. Who knows how to create studentâ? ?s interest in subject, how to improve their study skills, how to be their mentor during exam & how to be friend during their study stress. It is very important for us to provide our students exclusive study materials at every major steps of their study preparation and always available for their doubts. Vsmart created more than 50,000 + Professionals over last 10 years, including many national rankersâ?¦ and legacy is continued. Every year we teach 10000+ students in our live, virtual and online Classes. To join a vsmart coaching is quick & simple. We got a best team to guide you. Find a course you are interested in. Contact our Helpdesk for more info. Contact our faculties for better guidance you need. We are there for you. "Basically the chart and questionary helps me a lot and the teaching style of Vishal sir assume he. Or pictorial presentation of books that helps to memorize more things easily or sloving video of questions in YouTube free of cost that helps so many students those who were not taking coaching classes from Vishal sir. Thanks to vsmart academy for being panascia for the exam. " Vsmart Academy conducts classes in CA Coaching. It is located in Lakshmi Nagar, Delhi. It takes Regular Classes- at the Institute. It has got 1 reviews till now with 100% positive feedback.